During November 10-15, 2016, our team of researchers from Thailand together with local Vietnamese interpreters went onto a thorough survey of housing projects in Hanoi. We went to all the 124 housing projects found. There must be some where we did not visit. However, we hope to cover all next time. We expect that this survey cover some 90% of the current supplies which should be very much reliable for insightful analysis of the markets towards 2017. This survey covers housing projects currently offered for sale in Hanoi. Projects which was sold or booked out at the date of the survey in November 2016 were not considered because they were not considered current supplies anymore. In terms of areas, this survey covers Hanoi, the Capital City of Vietnam. Condominiums or owner-occupied apartments and low-rise residences of all form (detached houses, semi-detached or rowhouses) are covered. Of the total 124 projects, we found in four locations below. The delineation of the four locations is by the clustering of the projects. It may not be in accordance with the official boundary. We believe that the clustering of the projects would implies some good market insight. In the future, we would divided into more further detailed locations. 4. Tu Liem- Hoai Duc, 17 projects. 89,730 housing units including detached houses, semi-detached houses, townhouses, shophouses and condominiums (owner-occupied apartments were found in this survey. Some 68,661 units (75%) were already sold or booked at the time of the survey. The 21,069 units left were not too many in the markets. The total value of the units were USD 14.078 billion or on the average USD 156,892 per unit or 3.541 billion dong or 80% higher than the price in Bangkok. It was found that housing projects were launched during 2008 to 2016. Those launched prior to this period were too old to be surveyed. However, there might be some other projects launched recently but were already sold out. These projects were not covered in this survey as well. However, the analysis of this launching units would give some overall picture on the development of the markets during the past nine years. 2008 and 2009 were the worst two years where very few housing projects were launched. The few number of the units launched implied the lower amount of demand in the markets as a whole. Then the four years later (2010-2013), the number of launched units was also quite moderate at some 3,890 units per year. 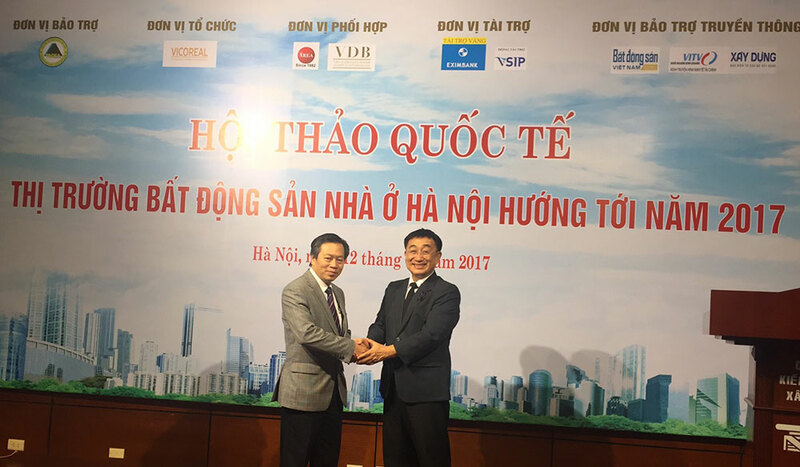 This indicated that the bust of the housing markets or real estate markets at large in Hanoi which started in 2008, was ended in 2013. It was a long period of 6 years to recover. Since 2014, the number of launched units was a lot higher to 27,683 units which was a leap-frog in the markets. The markets were recovered since then. However, in 2016, the number of units launched was dropped significantly to 16,889. This was an estimate for the year end (including December 2016) based on the survey in November 2016. Perhaps, the markets were more preliminarily adjusted themselves for the preparation on potential oversupplies in the future. The largest proportion of the units in the markets was in the Central Business District (CBD), 58 projects, 40,105 units or around 45% of the supplies. Hadong-Hoang Mai had 33 projects, 28,769 units or 32% of the supplies. Long Bien-Gia Lam had 16 projects, 8,050 units of the supplies (9%) and Tu Liem- Hoai Duc had 17 projects or only 12,806 units (14% of the supplies. This implies that most of the developments were still in the CBD. They moved southward to Hadong-Hoang Mai and then were scattered to Tu Liem-Hoai Duc. Those across the river were fewer. However, in the future, there might be more when the infrastructure is better and the flood protection plan is more effective. Because of the shortage of mass transit, the developments were centred in the CBD. It should be noted that housing in the CBD constituted some 53% of the total value whereas the share in units were only 45%. This implies that the average value in the CBD (USD 187,531) is higher than in other areas (averaged at USD 156,892) except in Long Bien-Gia Lam where the average prices moved up to USD 293,922 due to the development of luxury detached houses. Of the total 90,217 units surveyed, 91% of them were condominiums (ownered-occupied apartments). The rest were detached houses, semi-detached houses, townhouses and shophouses. Of the total, 82,317 units of condominiums, 26,399 units or 32% were offered at USD 90,000 – 150,000 per unit which is the largest proportion of supplies in the markets. Another 20,256 units (25%) were offered at USD 150,001 – 300,000 per unit. There were very few offered at a price below USD 60,000 per unit. This implies that the markets were still geared to the higher middle or the higher income groups instead of the lower income ones. On one hand, perhaps, the general public can still afford (informal) land subdivision plots in the fringe of Hanoi. Formal housing particularly low-priced condominiums did not prevail in the markets like in Bangkok, Jakarta and Manila. However, it could be expected that in the future, there might be a further down market trend. In 2016, some 22,388 units were sold in Hanoi. This number was higher than the number of units launched at 16,889. The markets were somewhat healthy. This is a clear interpretation on this performance. For the last one year, prices were changed for 1.5% only. Actually, there was on change in prices of condominium except those offered at USD 60,000-90,000 where some 4% of the increase could be catched. The return on investment (net rent) was only 2.7%; whereas, it was some 5% in Bangkok. However, in the case of condominiums, the return on investment was 4% which was the highest. This net rent is calculated from the amount of 10 months of rent divided by the value of the properties. Therefore, people are still investing in condominiums. However, one things to worry is the maintenance. Poor maintenance might have effect to property value. Well designed feature of the properties would ensure the effective maintenance and economize the costs. In the future, the down market trends to offer to lower-middle income groups might be a good direction. This will help house the mass majority. Then the market will grow more sustainably in the future. Perhaps, Bangkok is the best place to explore the development for the vast majority of the population. Institute of Enterprise and Real Estate is a science-itechnology organization operating under the laws of Vietnam. Its principles are towards professionalism, sustainability and innovation aiming for the benefits of the communities and the value of real estate organizations and members. Agency for Real Estate Affairs or AREA is the largest real estate information, research and valuation centre in the ASEAN, with the most frequently updated data from field surveys. We refrain from real estate brokerage and self-interest property development in order to avoid potential conflicts of interest. Dr.Sopon Pornchokchai, the President is with the global advisory of the US Appraisal Foundation and a Rep. of the Int'l Assoc of Assessing Officers. He was a consultant to the Ministry of Finance, Vietnam, Brunei, Cambodia and Indonesia.